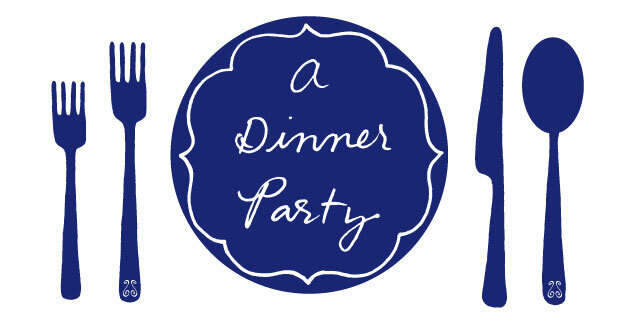 Just because I blog about dinner parties doesn't make me a picky pants when it comes to food. When dining at someone's home, I'm probably the easiest guest at the table to please. You could serve me almost anything and I would gobble it up with pleasure and ask how you made it, where you found the recipe, and any other number of questions until you start to think twice about inviting me again. Being fed in someone's home is a very special thing. I am so excited when someone offers to cook for me that the food itself is almost secondary. But if my friend Audrey is in the kitchen, it really is all about the food. Although her sparkling personality and sweet fiance Will don't hurt. After a very trying week, it felt heavenly to slump down on her sofa and be handed a deliciously tart gin-passion fruit cocktail. (Note to Audrey: marry that man!) After Trader Joe's snacks and catch-up conversation, we adjourned about three steps over to their little dining table for kale salad and chicken potpies. The menu was comfort food in all senses of the word. But what made it even more special was the level of comfort in their home. When you're feeling low, there's nothing more restorative than being fed something warm and homemade, being handed a cool drink, sitting down at a thoughtfully-set table. Although my stomach was very full on our long walk home that night, I felt immensely lighter. Happier, even. Restaurants love to talk about hospitality and taking care of guests and seamless service. But I've never felt more at ease as when I'm dining in someone's home. I really need to send you the mp3 for the chicken pot pie song! If you're going to encourage us like that, we'll just have to have you over again for dinner (and then of course for the weekend, once we move to DC). Gin passion fruit cocktail recipe please! I need this drink! The theory is that Anna Wintour likes to serve pot pies because they allow her dictatorial portion control. Audrey, care to comment? Casey: That sounds like something I would enjoy. Emilia: Maybe Audrey's fiance Will will enlighten us in the comments? While being vegetarian makes me slightly more difficult, I am also very easy to please at dinner. I love eating what others cook. What a lovely post! Sounds like a great evening with wonderful friends.